This week’s guest post comes from Shobha George who writes at the fantastic Just Go Places website. Shobha along with her husband and two kids enjoy travelling as much as possible. Shobha and her family are based in London England. Hohensalzburg Castle perches on a hill above the old town section of Salzburg like a bird watches its nest. When you visit Salzburg, it is one of the first things you notice. Before my visit to the city, my knowledge of Salzburg began and ended with watching the movie The Sound of Music countless times. This castle does not feature in the movie, and we were in for a delightful surprise! We stayed at a hotel, Altstadhotel Kasererbrau in the old town, where the family suite on the top floor has a window above the bed that looks straight up at Hohensalzburg. Every morning we would wake up to the view of the profile of Hohensalzburg against a blue sky. Of course, we had to visit Hohensalzburg Castle with kids. Attraction: Hohensalzburg Castle, among the largest of the European medieval castles, still standing, dates from the 11th century. It was built for the rich and powerful Prince-Archbishops of Salzburg. The Hohensalzburg Castle has been used as a fortress in the area from the 11th century until the 19th century. 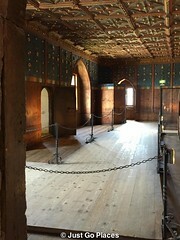 Along the way, there was extensive remodelling of the castle with the most renovations occurring in the 15th century. By then, the Prince-Archbishops of Salzburg were incredibly wealthy and the envy of their neighbours. Their gold mines in the mountains produced 10% of the world’s gold. The mountains also produced silver and ‘white gold’ or salt which was a very valuable commodity during medieval times. The Prince-Archbishops needed not only an impressive castle to show off their power and wealth, but also a deterrent against any greedy neighbours who would want to seize their principality. Hohensalzburg castle’s emblem is a lion holding a beetroot in its paw. My kids thought that was hilarious! The beetroot doesn’t exactly make the lion seem very scary. More vegan hipster. Anyway, the beetroot is probably attesting to the family background of the last Prince-Archbishop who remodelled the fortress and stuck his crest everywhere. The castle is such a hulking monument that it has hardly ever been under siege. 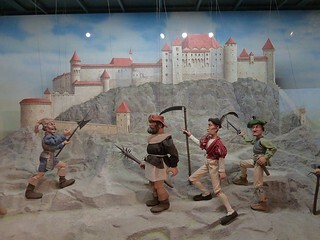 The one and only attack on the castle came from the residents of Salzburg (ironically!) in 1525 when they were protesting a particularly hated Prince-Archbishop ruler. The rebel miners and farmers with their homemade weapons were no match for the cannons of the fortress. 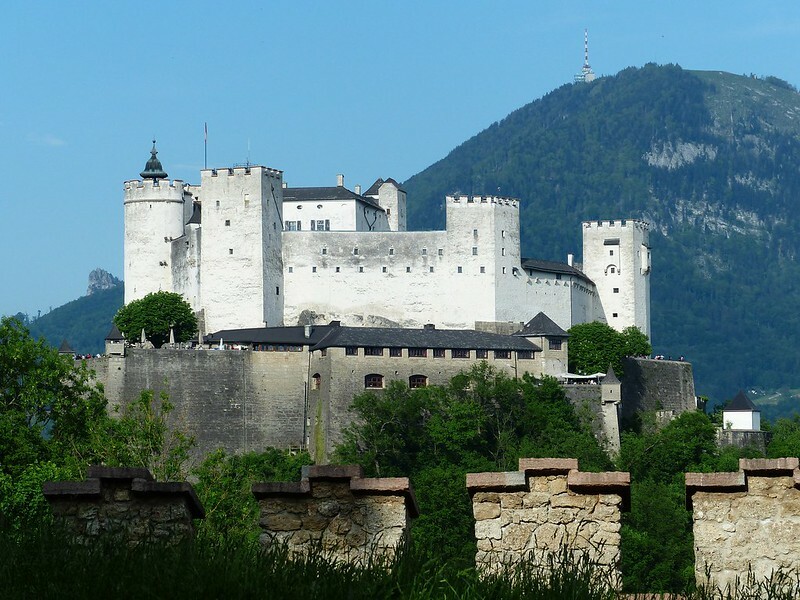 During the Napoleonic Wars, Hohensalzburg surrendered to the French peacefully and was used as military barracks. It also housed Italian prisoners of war during World War I and Nazi prisoners during World War II. There is a little funicular that goes from the old town of Salzburg up to the castle and back down again. The origin of the funicular dates from the 16th century which probably makes it the oldest operational railway in the world. We walked up the stairs to the Hohensalzburg but took the funicular down. The funicular runs frequently and it is a short ride. Your entrance ticket to the castle includes a round-trip on the funicular. My kids really enjoyed checking out the cannons that still peer out over the countryside. They also liked the little Marionette Museum. Salzburg is famous for its marionettes and we did not have time to check out a show. They also thought the medieval torture instruments on display at the little museum at the Castle were fascinating. There are two eating options located at the castle – a restaurant and a nice cafe. If you are lucky you will be able to snag a table by the edge which has extensive views over Salzburg and its surrounding countryside. As usual, they have wiener schnitzel and fries which should keep your less-adventurous eaters happy. 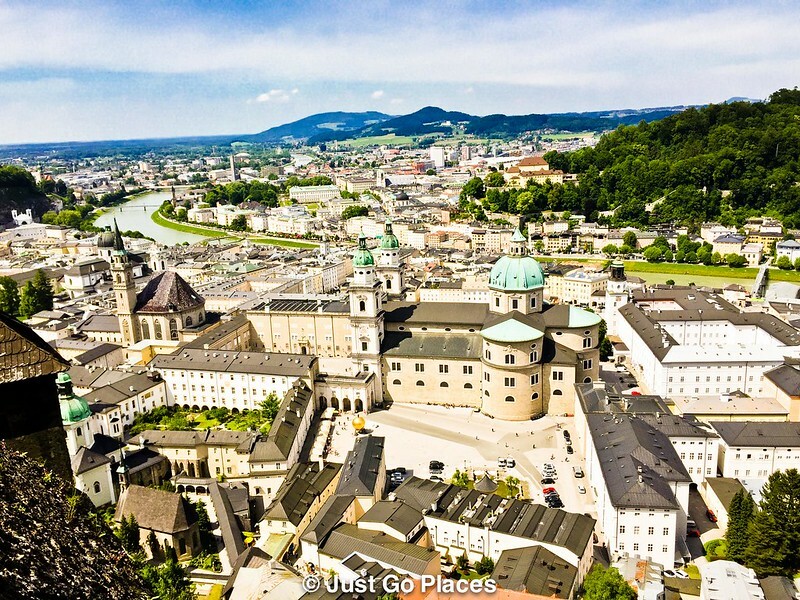 Hohensalzburg is considered one of the Top 10 sightseeing places in Salzburg. We would whole-heartedly agree that it is a cool place to visit both for its history and its fabulous views. Salzburg with kids is a great experience. 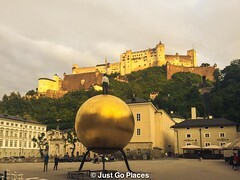 Salzburg can easily be reached for a day trip from many nearby cities such as Munich in Germany, Ljubljana in Slovenia, Cesky Krumlov in the Czech Republic and the Austrian capital Vienna. I think it’s great that you visit places that aren’t “kid-specific”. I’m sure your kids enjoy wondering around such ancient establishments. I had no idea Austria used to produce gold – very interesting! 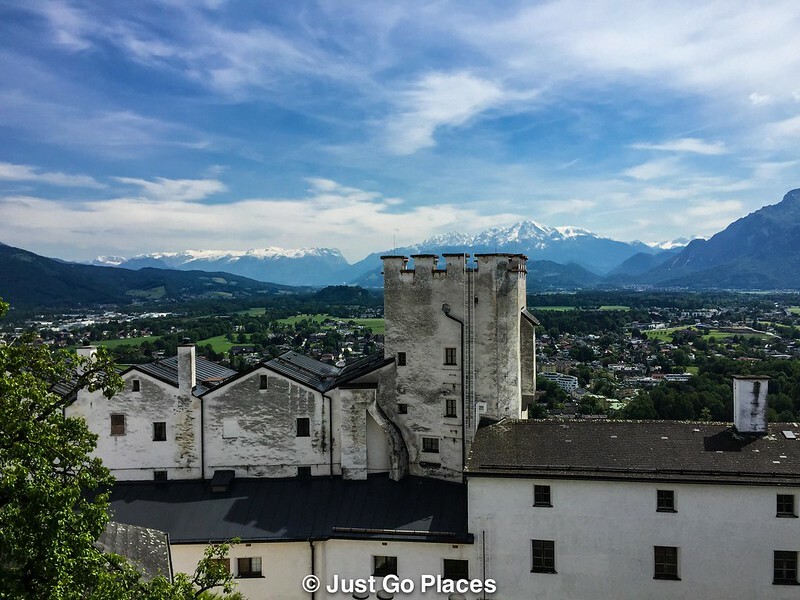 I’ve not been to Salzburg yet but have heard it’s beautiful – these pictures confirm that at least! Great views from the castle, and a great way to learn more about the history of the city too!